I was exposed to a lot of children's theatre growing up as my Mother is very much into arts and culture. Now I am a mother, and I would like my son to enjoy a variety of cultural experiences that will enrich his thinking and broaden his horizons. He is four, and having never attended a theatre show before, I wanted to take him to his first live stage show over this summer. 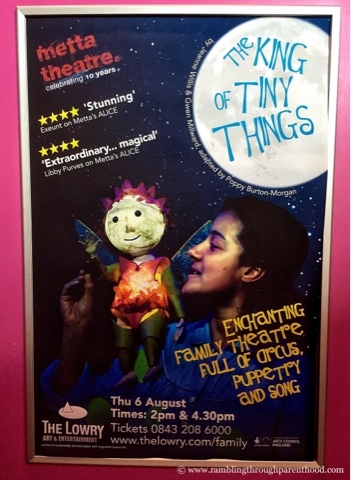 Metta Theatre invited us to review The King of Tiny Things, and I could not have asked for a better production for J to make his debut in the audience. The setting was The Lowry overlooking the picturesque Salford Quays. We have often visited the Quays, be it for the bridges or the food or the IWM. But we had never explored the beautiful Lowry Theatre. So here was another first to tick off our list. J was excited and intrigued in equal measures at the prospect of people performing live on stage right before his eyes. Frankly, so was I. It has been a while since I last visited children's theatre, and I could not wait to see how things have come along since I was little. I was in for a visual treat. The King of Tiny Things brought to life a beautiful story about a pair of children and their adventures by moonlight through the lands of mini-beasts. We saw a slug juggle, a caterpillar turn cartwheels, and a spider balance on stilts. J's favourite were the trio of baby bats swinging upside down from a beam. From a grown-up perspective, I found the production simple yet charming. The story was about facing fears, accepting change and importantly, kindness towards tiny things. The puppetry and shadow-play was enchanting and added a touch of magic. Without giving too much away, the end was dramatic and quite spectacular. The cast was wonderful with their breathtaking acrobatics and excellent audience engagement. I loved their precision and energy that kept going from start to finish. J has been thoroughly impressed and has expressed his desire to watch the show again. I love that The King of Tiny Things has fired his imagination and made him think about mini-beasts and magic. So much so, that on our recent holiday in the Lake District, he built a tiny den for The King of Tiny Things and was looking for little creatures in the moss and woodlands we visited. He and I have walked through the fells singing, "I am the King of Tiny Things, follow me, follow me, follow me!" Disclaimer: We were given press passes to attend a showing of The King of Tiny Things. All opinions are my own. We love the theatre. Always such a wonderful experience for all ages. I'm glad this first trip was a success. Sounds like a lovely show - we love theatre visits. It sounds like a great show! I would love this with it being puppets, how wonderful. Looking forward to one day taking my son to the theatre.